Human behaviour, no matter how predictable to marketing gurus, is also a big puzzle. True, people usually go with the flow and exhibit unbelievable mob mentality from beating people to death to turning filmstars to deities but it is always a little perplexing why they are like this. Take the recent sugar crisis. Yes we all know that Ramadan is here and the demand for syrupy lemonade will exponentially go up, hence the hiking up of prices. But honestly, with the number of diabetics in this country and all the health talk about how huge amounts of sugar in the system is generally not a great idea, one would think that people would come to their senses and cut down rather than spruce up, their sugar intake. Obviously taste takes precedence over self preservation. Hence the high demand for oil and sugar in this month so that one can toxify oneself after all that cleansing the body of food and drink for the whole day. Some people try their best to keep their diet in tune with the fast by eating healthy iftars consisting of bland yogurts, boiled vegetables and not-so-sweet fruits. But deep inside many of them are screaming for some over fried piaju, beguni and extra-sweet jilapi despite knowing that these are devilish concoctions aimed at reducing human lifespans and creating an unbearable amount of gas and acid in the stomach. Millions of others, on the other hand, will consume this decadently high quantity of oil and sugar with no qualms whatsoever, as if they have earned the right to abuse their bodies after so many hours of sacrifice. So there you have it. People want more and more sugar and oil this season no matter what. And they want the prices to go down. 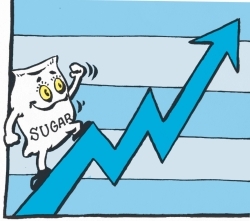 They don't care that a few sugar refineries have closed down because of the lack of supply of raw sugar or that sugar and edible prices all over the world have gone up. Knowing that there really is no use telling people that too much sugar and oil is bad for them, the government quite prudently has asked traders to keep the prices down. A human rights group has petitioned to the court and a directive has been given by the government and court to stop hoarding of these items. Bravo Bravo say the public. There are other things that cannot be explained convincingly. It is a mysterious phenomenon, for instance, that in a country that displays such religiosity during Ramadan, with diligent fasting and saying of the required prayers, traders and salespeople have no problem with their conscience when it comes to hiking up prices and cheating their customers out of a legitimate transaction. There is no question that traders have a gala of a time charging ridiculous prices for practically everything – 'essential items' like sugar and chillies as well as non-essentials like clothes and shoes. The dichotomy of the spirit of restraint and sacrifice and the frenzy of panic buying, hoarding and obsessive shopping during this holy month is truly a mind-boggling matter. These thoughts may plague us as we go through the extra misery of being rendered immobile in the paralyzing traffic jams that are sure to erupt during this month. It may cause long-lasting headaches and even dizziness. At this point there is only one thing to do: wait for the sugar fix at iftar.